Do you find yourself driving out of your way to stop at fun and quirky stops? Here are 10 must-see roadside attractions that are worth a detour. Roadside attractions have fascinated me since I was a little girl. 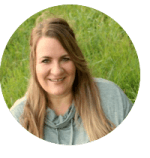 It may be because of the quirky and whimsical nature of roadside attractions, or it could be the nostalgia and history of the rise of the eye-catching roadside architecture that was created to lure road trippers into a gas station, restaurant, or other business. While many pass by these roadside stops without a second thought, there are thousands of travelers like myself that make it a point to seek out giant dinosaurs, shell-shaped service stations, and the World’s Largest baskets, drum sticks, and chest of drawers. Roadside attractions became widespread in the early 20th century with the invention of automobiles. As families began to travel across the United States, roadside advertising in the form of colorful signs, fancy buildings, and giant sculptures became a common feature on road trips. Today, travelers may use sites like Roadtrippers or Roadside America to help them seek out roadside attractions in a plethora of subject matters from the world’s largest paint can to the biggest ball of twine to the World’s Largest free-standing jail cell. The subjects are vast and varied. 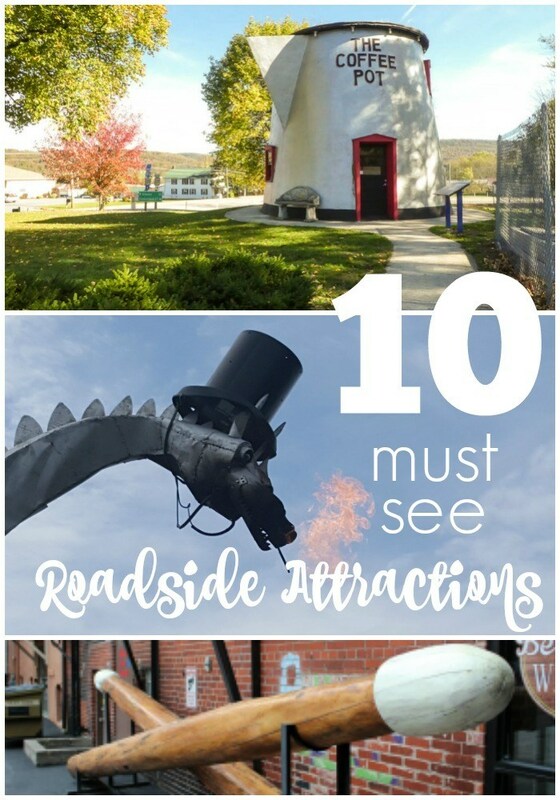 It would be impossible for me to choose ten favorite roadside attractions from the dozens I’ve sought out with my family but here are a few that I think are worth seeing. As a fan of Vincent Van Gogh, and sunflowers, I couldn’t resist a stop at this attraction that is visible from I-70 in Kansas. What many passers-by don’t realize is that this easel that towers over nearly everything in sight is not the only giant easel in town. 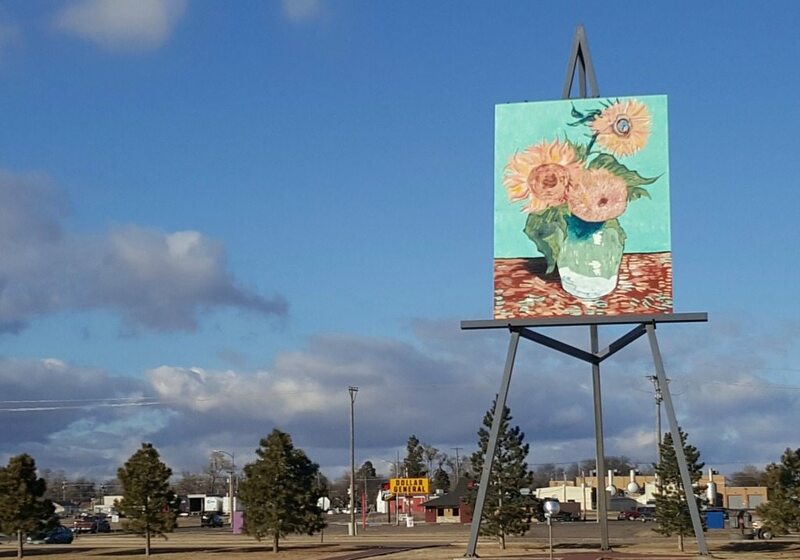 You’ll find a series of easels sprinkled throughout Goodland’s parks. I admit that I didn’t watch Gumby and Pokey growing up but I didn’t miss a chance to drive through Norco, which is located a short drive (depending on traffic) from LA on a trip to California to check out these iconic figures turned roadside attraction. Norco is worth a trip even if you don’t plan to see these giant sculptures that a homeowner has erected in his front yard. Known as “Horsetown USA”, Norco has replaced its sidewalks with horse trails and you’ll even find residents going through drive-thrus on a saddle. 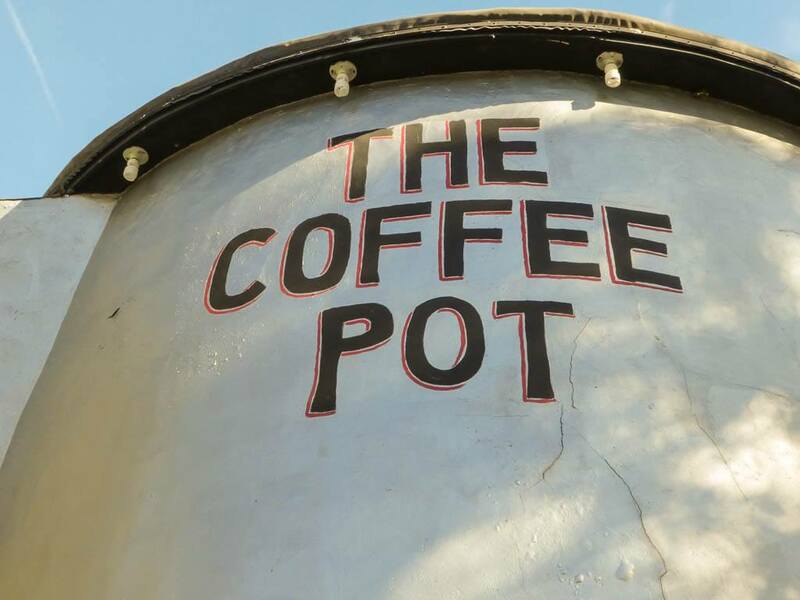 The Giant Coffee Pot along the old Lincoln Highway was saved from destruction by a roadside architecture enthusiasts group. It is one of the few remaining Coffee Pot buildings in the United States. If you’ve ever wanted to own a roadside attraction, here’s your chance. This giant building that was once used as offices by the Longaberger Basket company has seen better days. Listed for sale for a fraction of what it cost to build, this building is facing foreclosure. Popular during the 1930’s and 40’s, the WigWam Villages were a motel chain that featured rooms built in the shape of tipis. Three of the properties remain and are listed on the National Register of Historic Places. You’ll find them along Route 66 in Holbrook, Arizona and in San Bernadino, California. The third motel is located near Mammoth Cave National Park in Cave City, Kentucky. If you’ve watched Disney’s popular Cars movie, you may recognize the Holbrook property. 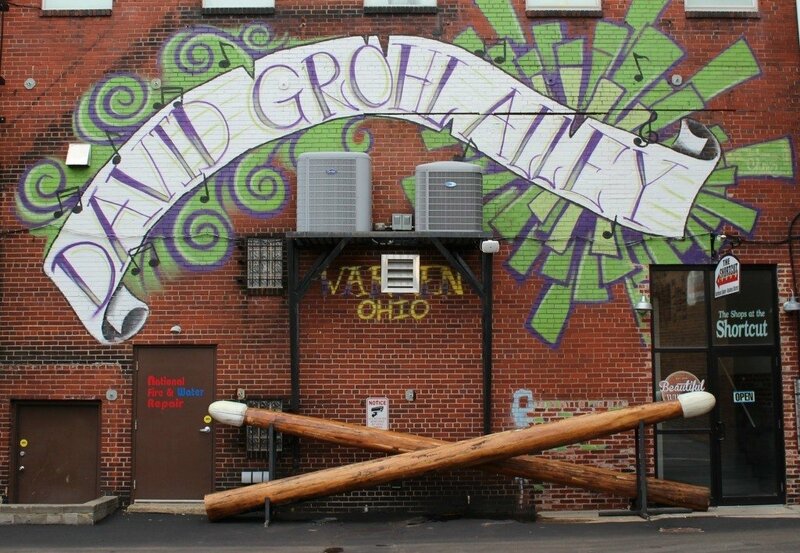 Fans of the Foo Fighters and Nirvana must make the trek to Warren, Ohio not only to strike a pose in front of the World’s Largest Drum Sticks but also to take a short drive to David Grohl Alley. That’s right, the famous drummer has an entire alley named after him and it’s full of murals, art pieces, and an artistic drum set. A must for anyone in the area and definitely worth a detour if you’re not. This is only one stop that I mention along the route to Branson, Missouri but it’s probably my favorite roadside attraction. Visitors may stop into the liquor store directly across from the dragon to purchase a token for a dollar. Insert the token into the box at the dragon and watch the dragon come alive as it spews flames from its nostrils. Located in Ohio’s Amish Country, this massive working Cuckoo Clock stands over 23-feet tall and is 25-feet wide. 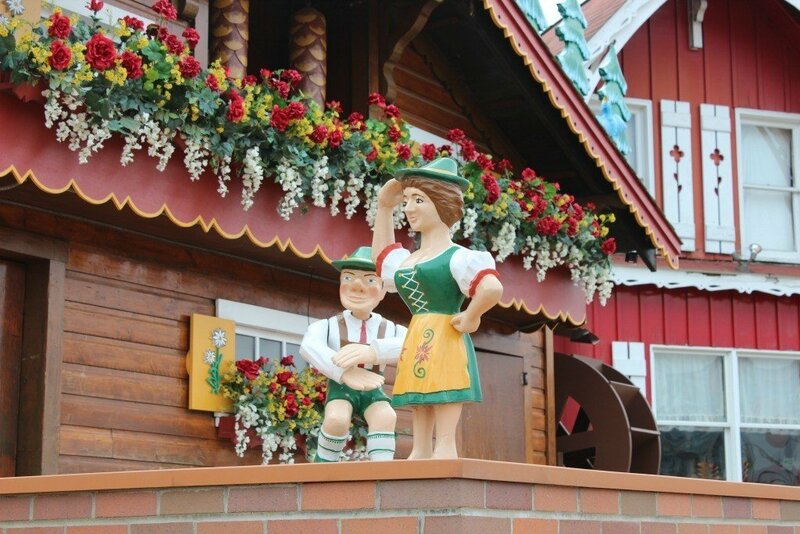 During the summer months, visitors line up ever hour and on the half-hour to watch the Cuckoo Clock come to life. If you’ve driven through this part of North Carolina, you would quickly realize why a replica of a chest of drawers is appropriate. High Point is known for the world-class furniture manufacturers that operate within its city limits. Nearby you’ll find the World’s Largest High Boy and World’s Largest Chair. Looking for more ideas for planning your road trip? A friend of mine recently wrote a fun book of things to do around the US. 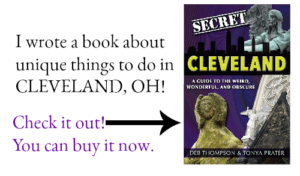 You can find it here ———> 100 Things to do in America before you Die. I’ll have a full review coming soon. Heading to the Orlando area? Skip the theme park in lieu of 5 Must See Kissimmee Roadside Attractions. And don’t forget to take the Magellan MiVue 420 Dashboard Cam on your next Road Trip so you can replay your trip later. We’ve seen the fire-breathing dragon (so cool and one of my favorite’s too) and the easel on our drive to Denver. The easel is big enough to see from the interstate (thanks to the flatness of Kansas). The coffee pot looks like a lot of fun! That’s a lot of funny roadside attractions! I didn’t realise road-side attractions were such a thing! I love the fire breathing dragon, and the art easels. 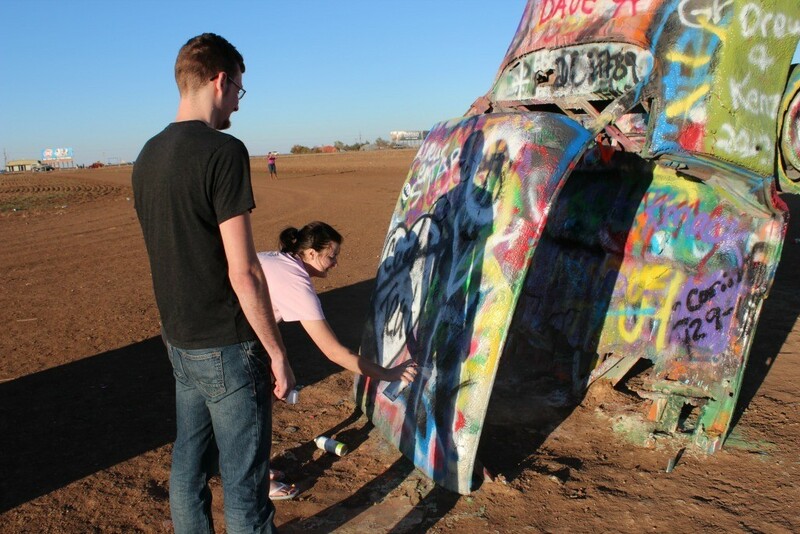 The Cadillac ranch looks cool, but it sounds disappointing – sometimes road trips don’t workout quite how we want!! Such a wonderful idea for a post! Really great idea, and I always love learning about quirky little places like to this to visit along the way. This is precisely why I would be in the US (if I was in the US). To see things like this. Coool. Especially the Dave Grohl alley. How fabulous is that?